The material properties we observe in our macroscopic world are often determined by the nanoscale, unseen by the eye. This is especially true for modern nanostructured materials which are mostly defined by their large surface areas and interfaces in comparison to their small volume. To fully understand and improve the processes these materials experience during their fabrication and the changes they undergo in applications, it is necessary to monitor them in situ on the nanoscale and under as realistic conditions as possible. To achieve this goal in an interdisciplinary approach the research training group GRK1896 unites four state of the art characterization fields, namely in situ electron and X-ray microscopy, a large variety of scanning probe techniques, scattering of X-rays, neutrons and electrons, as well as complementary modeling and simulation. 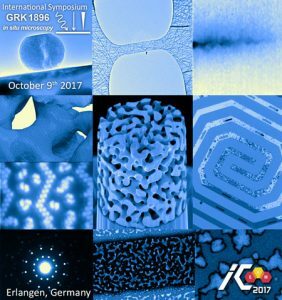 The focus of the International GRK 1896 Satellite Symposium “In Situ Microscopy with Electrons, X-rays and Scanning Probes” at the ICEAM2017 lies on recent advances in the direct study of material processes under the influence of external stimuli such as temperature, mechanical strain, magnetic/electric fields and chemical environments and their simulation by scale-bridging modeling techniques. The symposium aims to provide a forum for discussion between researchers from the University of Erlangen-Nürnberg and abroad and distinguished invited experts, to promote the interdisciplinary exchange of new developments in the rapidly evolving field of complementary in situ microscopy and simulation techniques. Applicants will have the chance to present their research in form of a talk or poster in the categories of Functional Nanostructures and Networks, Mechanical Properties of Interfaces, and Modelling of Processes at the Nanoscale and to participate in fruitful discussions on cutting-edge nanoscale materials research strongly related to the ICEAM2017 congress. The Center for Nanoanalysis and Electron Microscopy (CENEM) is a facility featuring cutting-edge instrumentation, techniques and expertise required for microscopic and analytical characterization of materials and devices down to the atomic scale. CENEM focuses on several complementary analysis techniques in close collaboration: Electron Microscopy, Cryo-TEM, Scattering Methods, Scanning Probe Techniques and Atom Probe Microscopy. CENEM was established in 2010 as part of EAM to provide a forefront research center for the versatile characterization of materials and devices with state-of-the-art instrumentation and expertise and to intensify interdisciplinary research. In October 2013 a new DFG Research Training Group with the title “In situ microscopy with electrons, X-rays and scanning probes” was started. The CENEM is the perfect host for this doctoral program since it involves students with techniques and expertise in all three areas of nanocharacterization.